This skin care staple will lift and tone aging and sagging skin, while reducing skin discoloration due to sun damage, aging and acne scarring. Vitamin C, a powerful antioxidant, takes charge over free radicals and repairs damaged skin while lifting and toning; Hyaluronic Acid promotes absorption of Vitamin C and hydrates the skin by maintaining moisture in the connective tissues. Helps achieve maximum lift and brightening using the antioxidant power of Vitamin C while supremely hydrating the skin with hyaluronic acid. Vitamin C has been shown to be a key component in the protection of collagen fibers. This unique concentration of Vitamin C will help stimulate cells to produce collagen and tighten the dermis layer. Apply evenly over the entire face, neck and décolleté area. 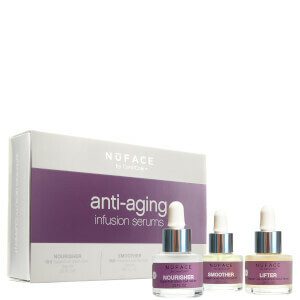 Use after the Smoother Infusion Serum and before the NuFACE treatment for best results. For maximum effectiveness, the Lifter Serum should not be used in combination with the Collagen Booster. Water (Aqua), Ascorbic Acid, Glycerin, Butylene Glycol, Sodium Hyaluronate, Sorbitol, PEG-8/ SMDI Copolymer, Camellia Sinensis (Green Tea) Leaf Extract, Dimethicone, Hydrolyzed Glycosaminoglycans, Glycolic Acid, Polysorbate 20, Phenoxyethanol, Caprylyl Glycol, Ethylhexylglycerin, Hexylene Glycol, Zinc Sulfate, Sodium Hydroxide, Xanthan Gum, Pyridoxine Dipalmitate, Disodium EDTA, Ergothioneine, Allantoin.